If someone were to ask me what my perfect outfit would look like, I would say something along the lines of: sleek, skinny, and severe (Think Mary-Kate and Ashley’s clothing line, The Row). I love dark skinny jeans, glossy sleeveless tops, and of course, a great shoe. For the spring and fall months, I think an uncomplicated ballet flat is the perfect shoe that can be dressed up or dressed down and stiletto booties are perfect for when the weather gets colder. However, I always have trouble finding the perfect summer shoe. I found eight great styles that I think trend along my idea of a “sleek summer shoe.” I found styles that are wearable, elegant, and can be dressed up or dressed down. Now throw away your flip-flops and step into a delicious pair. I promise your feet will be happy all summer. What I like about this sandal is its beige color, which is flattering for all skin tones, and the slightly industrial hardware. The chunky buckle and braided back keep the shoe from being too prissy. When done right, I think metallic during the daytime is genius. It’s the perfect amount of glimmer that can make an outfit stand out. 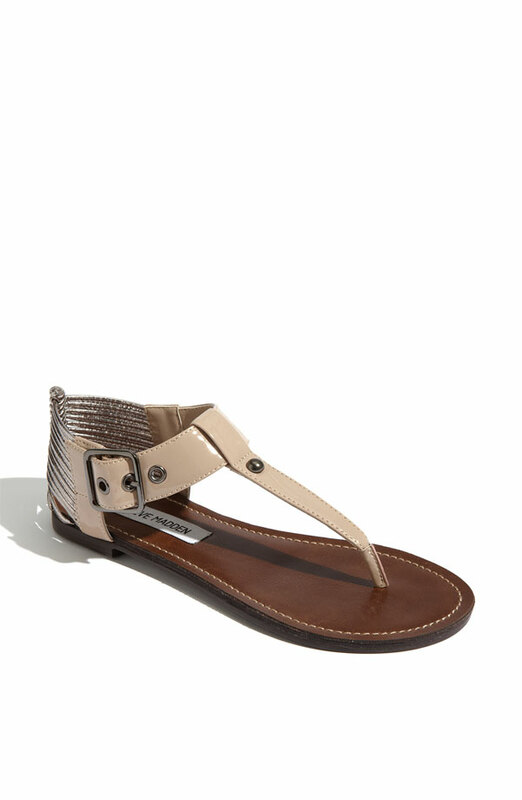 This one by ECCO combines two of my favorite things: a sandal and a T-strap. I love T-straps on heels and combining it with a metallic sandal makes it very trendy and sleek. The cutout in the back keeps the sandal updated. I typically wear a decent amount of black, and I am trying to incorporate more and more color into my wardrobe. The citron color of these sandals caught my eye. It’s summer after all and I think people should have fun with their wardrobe and not take it too seriously. How cool do these look? The cloth cover adds comfort and a stud in the front adds a little glamour. The colors are wearable and workable. These sandals are a great transition into the fall too as they would look great with a fitted black skirt or skinny pants. I think the wrap around trend is really cool, however, sometimes I feel like it can start to look a little messy or sloppy. These shoes perfectly solve our predicament. They have the wrapped look around the ankle, but the skinny black straps keep it from looking messy. In fact, I think these are quite chic! I really like the structured look of this shoe. I think summer footwear should be exciting, not lazy (i.e. flip flops). 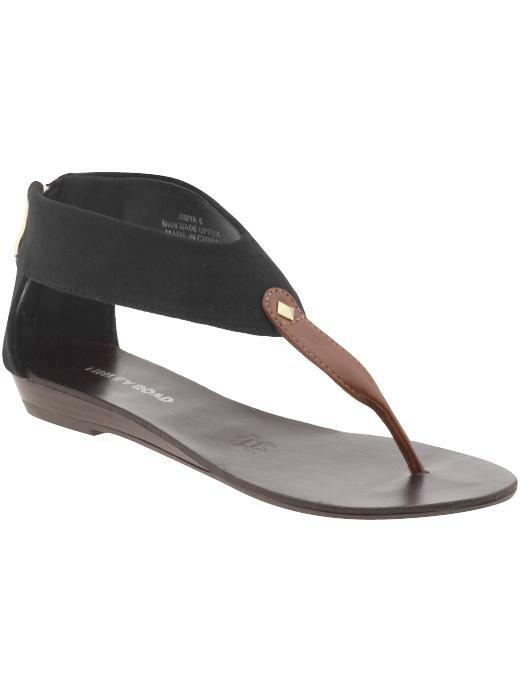 The double ankle strap adds sturdiness and the unconventional toe strap makes this sandal particularly eye-catching. Great style doesn’t have the break the bank. I absolutely love Forever 21. This sandal has gorgeous golden square beads decorating the front that decorate an otherwise plain sandal. I think leatherette is a great option for those who either want to spend a little less money on shoes, or prefer not to wear real leather. 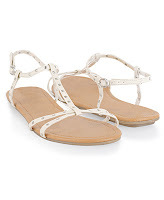 I love these sandals because the studs are circular (not to punk-ish) since there are a lot of them on the shoe. Although white can be a little trickier to pull off, I think as long as you wear a little white somewhere else in your outfit, you’ll be golden.